Over the past few weeks, there have been lots of great news stories about aquariums, fish and the ocean – too many to each get their own blog! Some are funny, some amazing, some sad. Here is a run-down of some of my favorites from the aquatic sphere. Hello, Frank Indiviglio here. 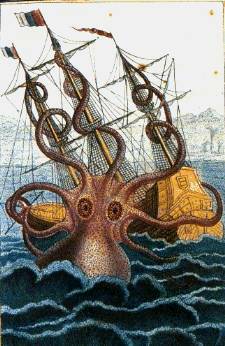 For centuries, sailors have repeated the legend of the Kraken, an enormous octopus-like creature said to attack ships (please see artist’s recreation). Today we believe that such tales were based on actual sightings of real-life Giant Squids, which may exceed 60 feet in length (frightening, but never observed attacking ships…as far as we know!). However, recently uncovered fossil evidence suggests that a giant octopus actually may have haunted the Triassic seas – and that it was able to capture bus-sized marine reptiles known as Ichthyosaurs! School isn’t always the most stimulating place for kids to be all day, but as I remember, there were some things that made long days much more interesting and bearable. Visual aids and interactive tools, to me anyway, could reinvigorate my zest for learning. The most interesting and anticipated place in my school was the science wing. Those rooms were always full of the most interesting things to look at–specimen jars filled with preserved animals, reassembled skeletons, and of course, live displays. Having tools like these in the classroom for hands-on experience and to break the monotony of repetitive days is something that, for some students, may instill more passion, curiosity and interest to increase their scholastic performance. With a little money, know-how and effort, simple aquarium set-ups in a school or classroom can become invaluable tools as well as enhancing the sometimes sterile aesthetic. The most obvious benefit of having live displays in classrooms is the offering of “hands-on” education. 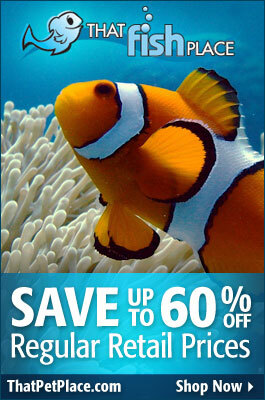 It can be any kind of set-up…freshwater, saltwater or reef, or even a reptile, amphibian habitat. Each unique set-up can provide relevant topics and visual aids for biology, anatomy, chemistry, ecology and physics courses. Not every kid in the class may have the opportunity or means to see aquariums up close. You can provide a platform for such students to “see” the nitrogen cycle in action, witness the process and stages of fish reproduction an development, or maybe chronicle predator/prey, symbiotic, or other co-habitation relationships between the organisms in the display. And that’s only the beginning! These live and variable habitats can be great for developing critical thinking and problem solving skills. What caused a fish to spawn? Why do fish school together? Why did a fish get sick or die when the others seem healthy? Aquariums can be beneficial in non-educational ways to students and faculty as well. Peering into the serene aquatic environment can ease stress and calm spectators. Tests, deadlines and other pressure points can influence a child’s ability to focus…an aquarium can help to alleviate this tension for some. This is one reason why you often find aquariums in dental and medical offices. too. Aesthetically, a well-maintained aquarium can enhance any environment. Whether in an individual classroom or a lobby or hallway, any live habitat is sure to draw attention and smiles. Worried about the responsibility of keeping the tank maintained? Why not consider an extra-curricular club or group to help with the work? Interested students or other faculty members can gain even more experience for an hour or so a week. Water changes, filter maintenance and other duties don’t have to be work, they can be continuing education! Aquariums and other live displays are of value to more than biology and chemistry. These set-ups can be inspiring! Think of applications other educators can use–reading/research and writing topics on aquariums can be endless, encouraging good writing, grammar, and research skills. Factual reports and journals aside, a nice aquarium set-up and some colorful fish can inspire kids of any age to create art and creative writing stories, too. They can even be tools for math, applying formulas to find out volume, dosing amounts of supplements or medications, and much more. Imagine the classroom discussions and problem solving skills that can be developed using such a tool…the possibilities are endless. A classroom set-up may seem intimidating or overwhelming to a teacher who has never had experience with aquariums or animals before, but it doesn’t have to be. You’ll just need some basic essentials and a basic knowledge of what to expect to get started. There are even kits available that are almost out-of-the-box ready. Pet store staffers and hobbyist forums can help you with any questions or problems you may run into. Habitat kits are also available for reptiles and small animals which can also be great additions to a teaching curriculum. Remember when it was your turn to bring the class pet home for the weekend? Whether or not you personally had that opportunity or you know a child who has, you can recall the excitement of the experience. It may have been one of the things that got you into the aquarium hobby to begin with. Maintaining aquariums and other live animal habitats provide kids of any age not only with practical education, but it also helps them to develop a sense of responsibility and pride. Parents may find that an aquarium is a great way to keep kids motivated and interested in learning while also increasing emotional bonds, and maybe even life experience to some degree, over a common activity or project. Keep in mind, it doesn’t have to be complicated. A betta bowl, a hamster…something small and easy to care for. Plant the seed early, nurture it, and chances are the interest will grow as the child does, along with the thirst to know more. If you can’t do it at home, encourage your child’s teachers or contribute funds and materials towards live displays in your local school for this year and generations to come. Anyone who has ever experienced a flood first hand will have very few (if any) positive things to say about the disaster after the water recedes. Recent flooding in the northeast left thousands to bucket mud and sediment from their homes and some lost their homes entirely. Floods for us are rarely a benefit, but for fish and waterways, flooding performs vital work. Despite the unfortunate individuals that find themselves stranded in backwater pools and puddles (most of which are picked off by advantageous predators), the fish that remain or find their way nack to an adequate stream or river can thrive after these events. Lets explore how wild fish respond to flooding and how these events can relate to some species we keep in aquariums.